Hey there, everyone! 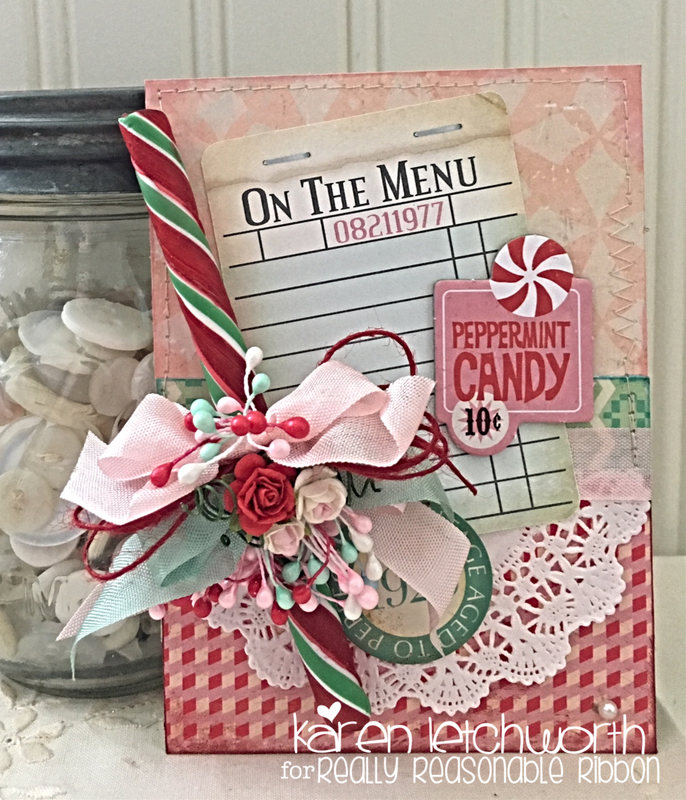 Welcome by today as I (Karen) share an extra sweet card I created using lots of fabulous products from Really Reasonable Ribbon. 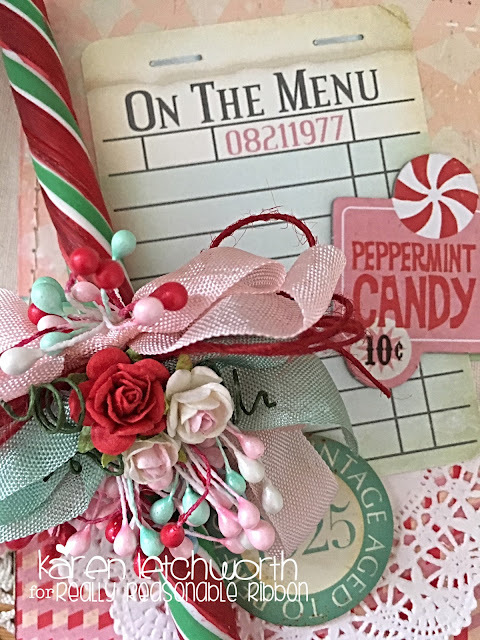 I used some older Crate Paper (Peppermint) patterned papers, chipboard and stickers. When I saw that chipboard sentiment (Peppermint Candy), I knew right away that I wanted to add a real peppermint stick or candies to my card. I attached my patterned papers using a fabulous Adhesive called Scor-Tape, and I inked the papers' edges and then machine stitched around the upper edges. At the center of my card (or just below center actually), I added a "menu" journalling card and half of a white doily; and then I ran a width of Baby Pink Seam Binding across my card. I tied the bow with more of the Baby Pink Seam Binding along with some Bay Leaf Seam Binding, and a bundled length of Red Burlap String. 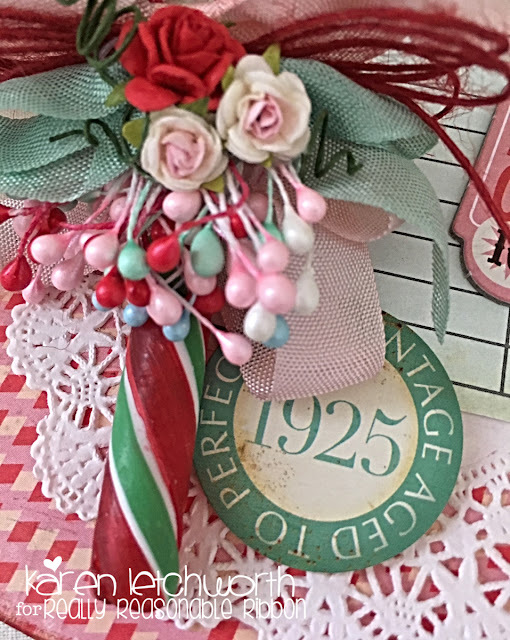 There are also lots of my very favorite Embellishment of all....loads of gorgeous Red Double-Head Stamens, White Double-Head Stamens, some Baby Blue Double-Head Stamens, and even a few Aqua Double-Head Stamens cascading through my bow to highlight that sweet peppermint stick. I topped that sweet bow cluster with some beautiful Open Red Roses, and some Open Roses in pinks from the lovely Mixed Pinks 10mm Open End Roses. All the pinks in this sweet set are absolutely GORGEOUS...just like all the wonderful Mulberry Flowers found in the RRR Shop. Thanks again for stopping by today. I hope you'll be sure to stop by the Really Reasonable Ribbon Blog for even more fabulous inspiration and for updated information about special sales and events (such as our monthly Blog Hops) taking place. We always love to have you visit, and we're happy to answer any questions. Oh wow! This is spectacular, Karen! I love this card...such a happy one!! Oh my! How pretty! (I am so fighting the temptation to say it is 'sweet'! lol) I love the colours you have chosen. I would never have thought of the pretty aqua with the green and red but it has such a great retro vibe. This is adorable, I love the reds and pinks together with that little touch of aqua, beautiful color combination!